The wet winter means that seedbeds may be in poor shape as the sprayers go back into the field. 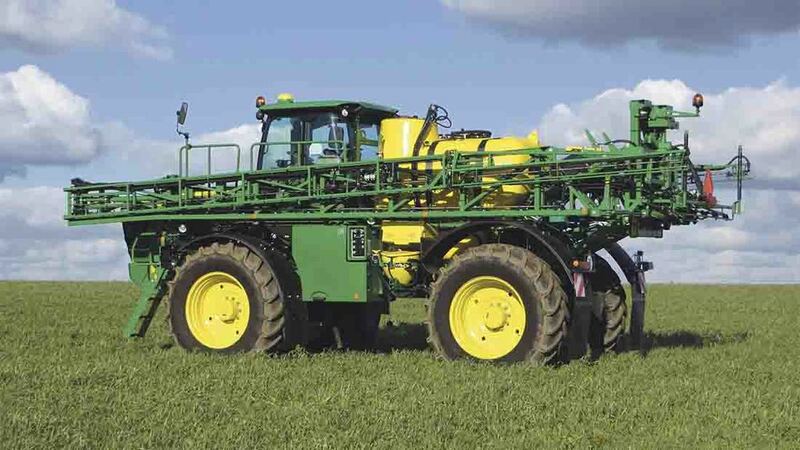 A recent industry-organised self-propelled sprayer demonstration gave the opportunity to study boom suspension and levelling systems which may help get sprays where they are needed. Jane Carley reports. Horsch uses a mast system to mount the booms, with the pendulum suspended via bearings at the top. Key to boom stability, says the company, is keeping the boom weighted evenly to maintain control on slopes or the headland. Its slope compensation system uses a six ultrasound sensors across the boom linked to a gyroscope and potentiometer in the centre which activates the tilt cylinders to continually adjust the boom to its ‘zero’ level. This continual correction takes the form of small movements. Sensor positioning is also significant, with Horsch placing them outside the wheel track of the sprayer, so that they are not affected by movements of the wheels or machine movement. 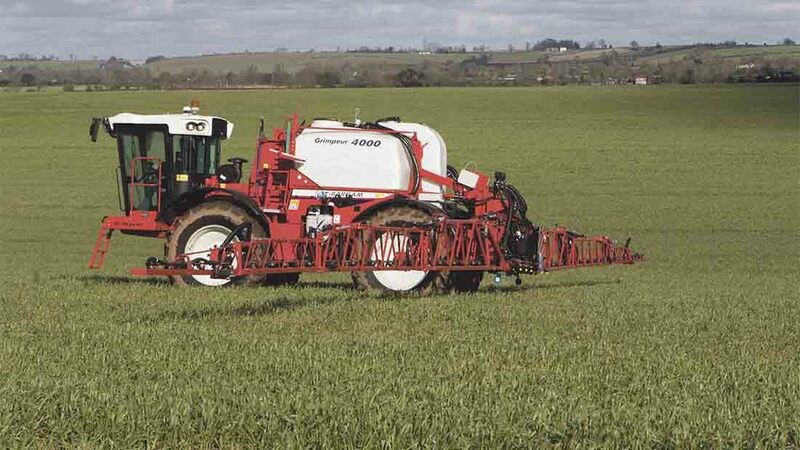 Increased control accuracy means that the boom can ride closer to the crop, claims the manufacturer, maintaining spray pattern at a height of 350mm, even on wider booms. The boom also features a double variable geometry system which splits the boom into four sections all of which can act independently to compensate for uneven terrain – the system can work in a negative plane when cresting a slope as well as lifting above the horizontal. 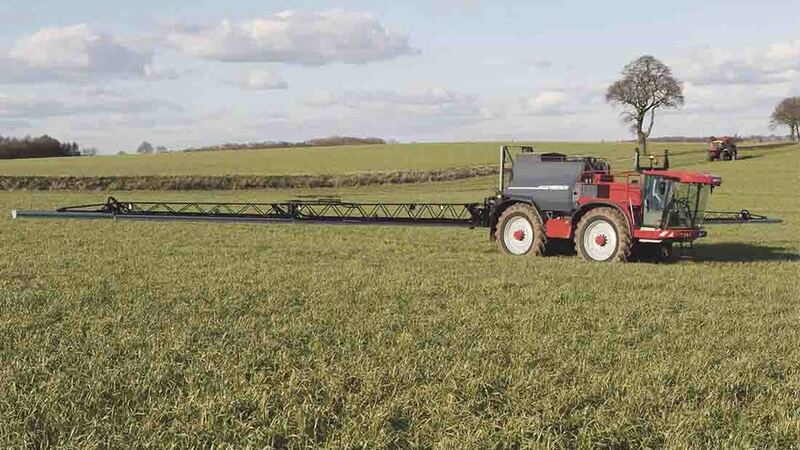 Seen here on the Multidrive demount M380, Chafer also utilises a mast system said to provide a more consistent boom ride by ensuring the boom and centre frame are always the same distance behind the rear axle, regardless of boom height. Chafer’s centre frame has additional suspension and damping for vertical, tilt and yaw movements, each of which can act independently of the other, ensuring movement is not induced by the centre frame itself. Tilt suspension uses an air spring system to allow precise control of spring rates, with tuneable dampers also included within the system, plus an additional air spring to provide further vertical suspension. The tilt pivot features a precision bearing located at the top of the centre frame, designed to offer the best balance between isolating the boom from lateral movements while maintaining a controlled stable boom in general field conditions. 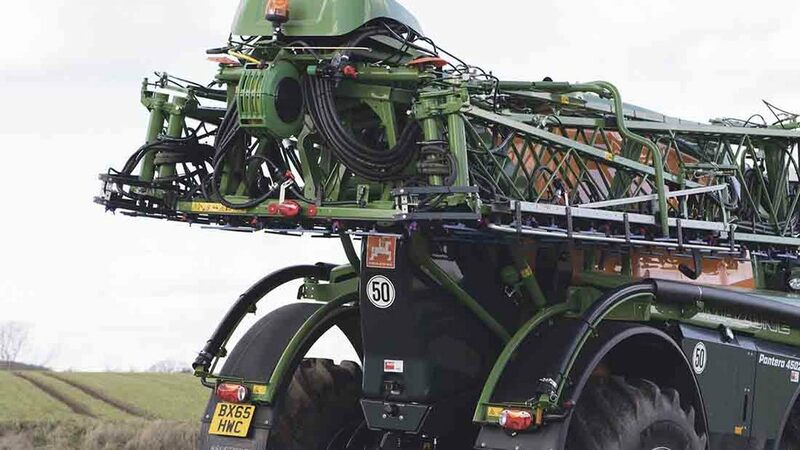 Chafer’s own Contour levelling system uses ultrasonic sensors to maintain boom height, while headland lift automatically raises each side of the boom when the master spray switch is turned off. 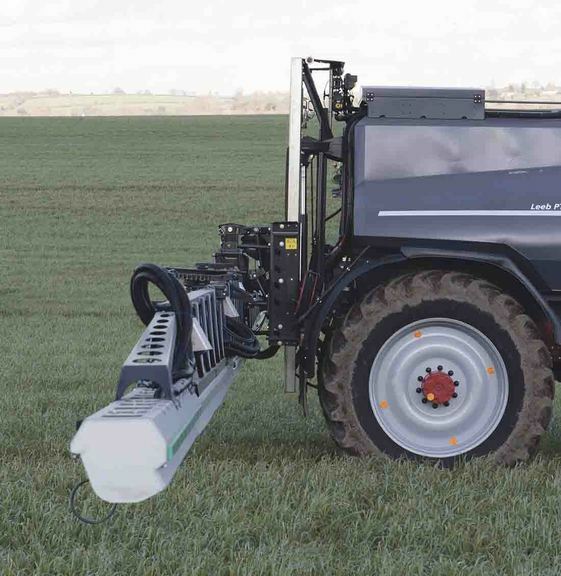 Househam Sprayers, which also uses a mast system with centre pivot boom mounting has developed its own boom levelling system for the Merlin M4 with five ultrasonic sensors and variable geometry. 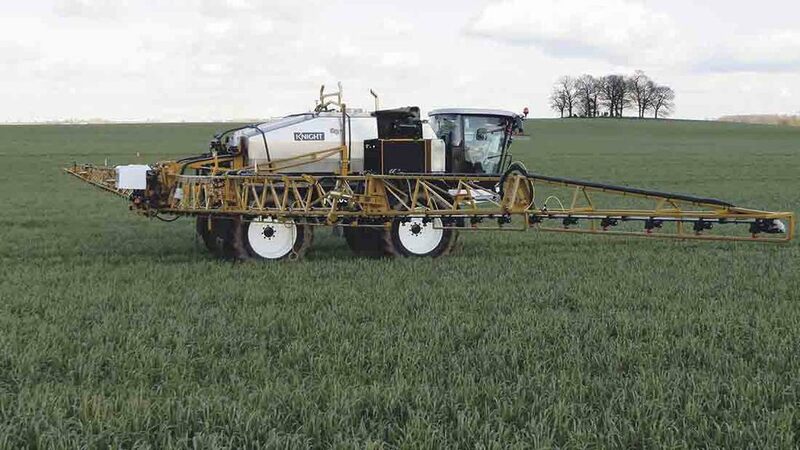 Landquip’s CV self-propelled sprayer has a parallelogram suspension which features a hydraulic anti-yaw system. Originally designed for wider booms which are subject to greater stresses, the system cushions yaw movements using hydraulic dampers rather than springs or rubber blocks. Pressure in the accumulator can be adjusted to suit conditions and double acting rams with a chrome rod at each end of the centre frame take up shocks. 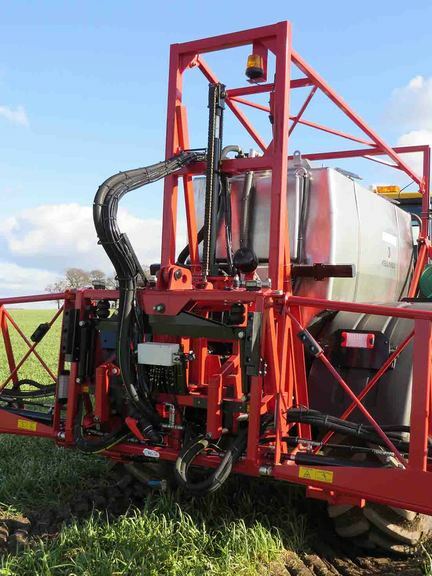 Challenger integrates its boom suspension with the suspended chassis on the RG655C by mounting the boom frame on a pivot in the centre of the machine. The boom lift arm hinge point is ahead of the rear axle in the most stable part of the chassis, helping to reduce the amount of movement transferred to the boom. Combined with the parallelogram boom construction, this keeps the centre frame close to the rear axle for stability. Hydro-pneumatically controlled wheel suspension absorbs lateral and vertical vehicle movements before they reach the boom, while hydro-pneumatic damping allows the operator to block the outer two cylinders when making high-speed turns. Dedicated damper suspension cylinders take up horizontal and vertical boom movements, together with those created by vehicle acceleration and deceleration. Ultrasonic sensors mounted on the booms ensure precise spraying accuracy by maintaining a consistent boom height, and independently follow ground contours. 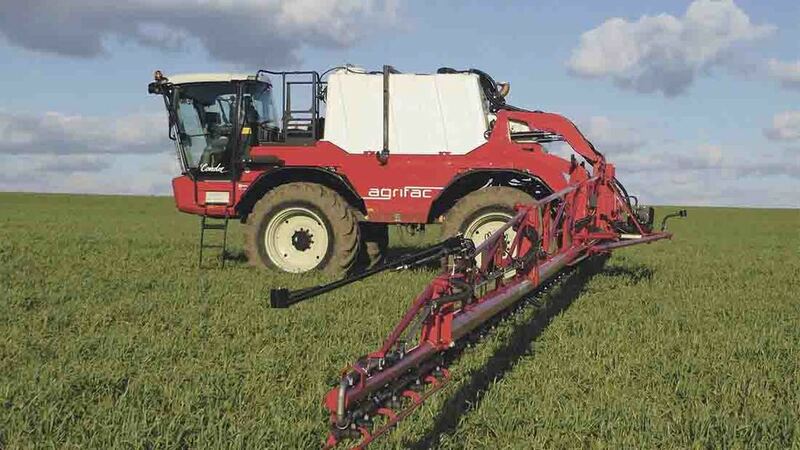 Like Challenger, Agrifac attributes much of its boom stability to chassis design, along with parallelogram boom mounting on the Condor self-propelled sprayer. The system features anti–yaw buffers and active boom height adjustment whereby the boom rolls over a half moon-shaped suspension which ensures that the balance is correct in each situation. 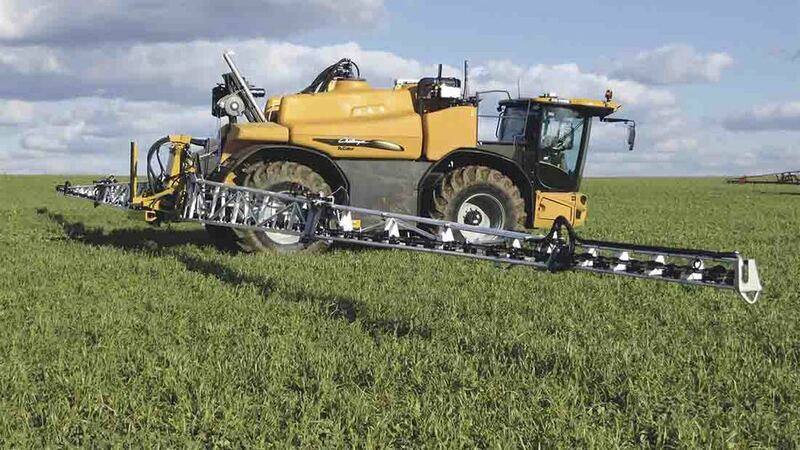 The optional ProActiveBalancePlus system regulates the position of the half moon automatically so the boom remains in balance even in difficult conditions, such as deep spray tracks. 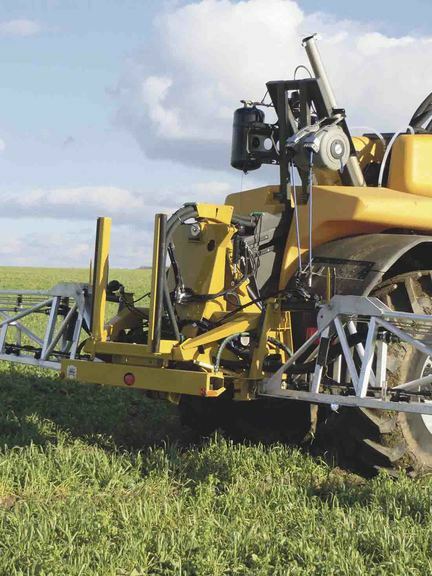 The BoomSupportPlus levelling system uses sensors on the boom to measure the distance from the boom to the ground or the crop and keep this constant, working in conjunction with the variable geometry system to follow the ground or the crop, even if the slopes change quickly, says the manufacturer. Tecnoma’s Laser 4000 is best known for its independently suspended cab design, which as well as lowering to the ground for access, ‘floats’ when in work, insulating the operator from vibration affecting the chassis. The parallelogram features a single large diameter lift ram which suspends the boom on the back frame and controls yaw from the centre to minimise swing using dampers which can be adjusted to suit the terrain. Variable geometry can also be adjusted to increase or reduce damping across the boom. A Mueller auto boom levelling system is fitted. When in the folded position, the boom remains suspended rather than sitting on rear rests, continuing to absorb shocks at transport speeds. John Deere’s suspension systems are based on a pendulum, using parallelogram mounting to give better control of tilt and yaw. The boom on the R4040i is said to be naturally self-levelling to remove any erratic movements that can affect the height above the crop and thus spraying efficacy. The boom is suspended from the top of the back frame to give a long pendulum action for smooth boom ride. Yaw damping is achieved via polyurethane dampers, which absorb shock and then relaxes rather than returning the forces as rubber can. John Deere’s Boom Trac Pro with variable geometry is an option using ultrasonic sensors to offer automatic and independent left-right boom height adjustment, adapting to the terrain. 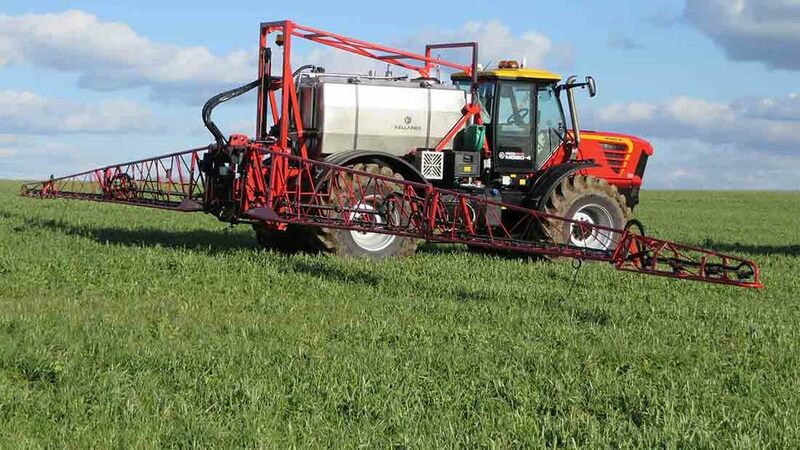 Amazone’s Super-L boom on the Pantera features a ‘truncated’ pendulum system, with the top of the pendulum closer to the nozzle carriers than many designs, to reduce the amount of roll potential which pendulum systems can have. Yaw movement is damped by sandwiching the pivot pin between a mixture of rubber buffer blocks and added brake pads of various thicknesses depending on the boom width, and the whole boom is damped against yaw. Roll movement is damped by a gas shock absorber on the pendulum arm. Springs self-level the boom back to the horizontal, working against each other and the movement to keep the boom level. 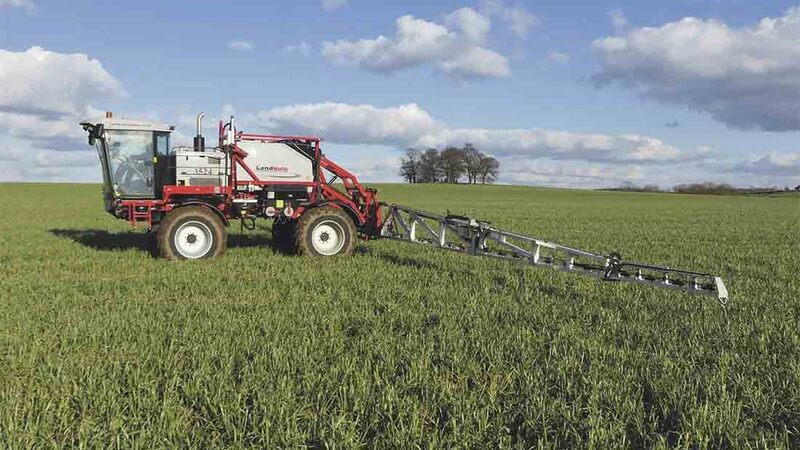 Sands uses a Norac boom levelling system on its Horizon sprayer which works alongside its variable geometry system, offering incline from halfway down the boom rather than at the centre. 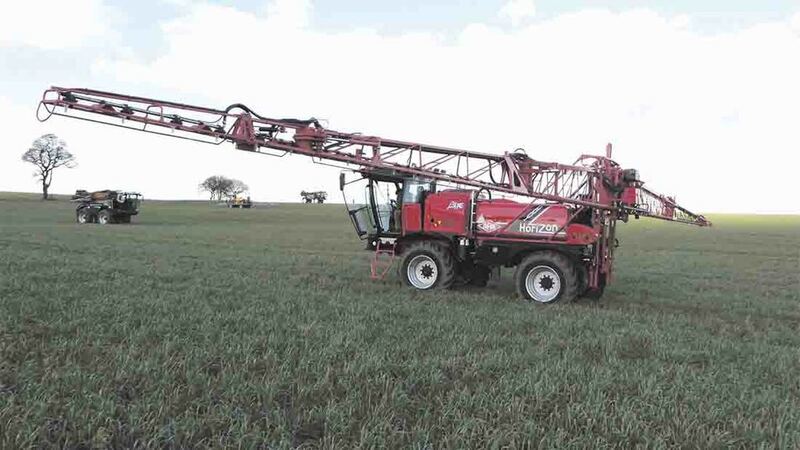 The boom also automatically inclines when spraying is switched off at the headland, returning to its working position when the spray comes back on. 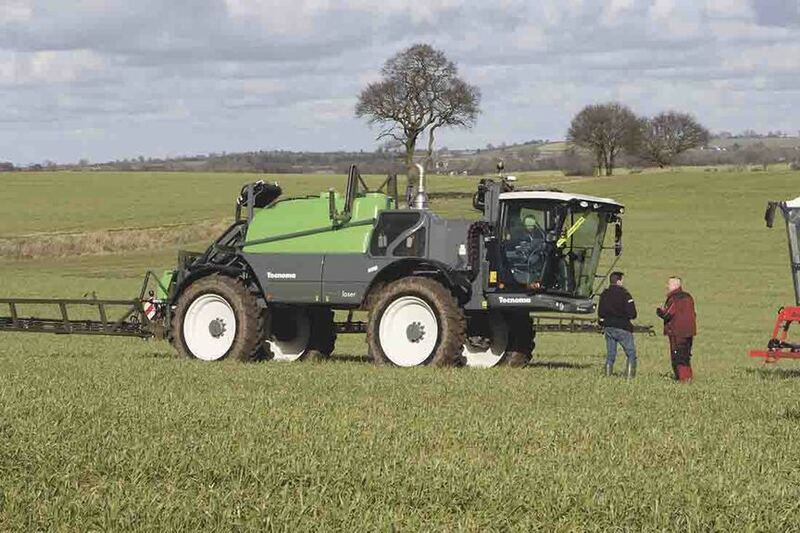 On the 2050, Knight Farm Machinery uses Mueller’s Distance Control II boom levelling system which uses a sensor on the back frame and at the end of each boom. 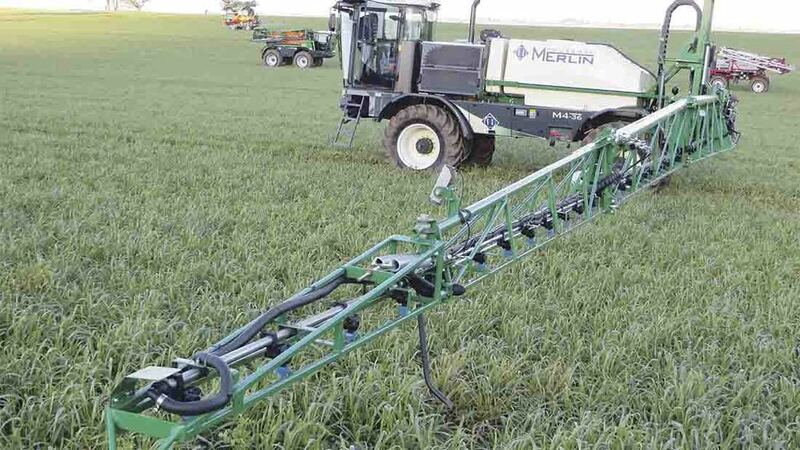 This three-point sensing is said to allow the whole of the boom to follow ground contours, and to produce constant, smaller movements in response to changes in terrain rather than fewer, larger movements for increased stability, keeping the boom at a consistent spraying height. Knight uses the pendulum/parallelogram system with springs and dampers but incorporates a double pendulum to pivot from two points and allow the boom to follow ground contours more closely. This 36m Knight boom also features breakbacks at 24m width as well as the conventional 28m, offering greater protection if striking a post etc. Bargam offers the choice of Mueller Distance Control I and II systems, with the simpler Distance Control I taking care of boom tilt and inclination. The company adds hydraulic accumulators to control variable geometry and the parallelogram boom lift for simplicity, and the company points out that both systems work with the axle suspension. 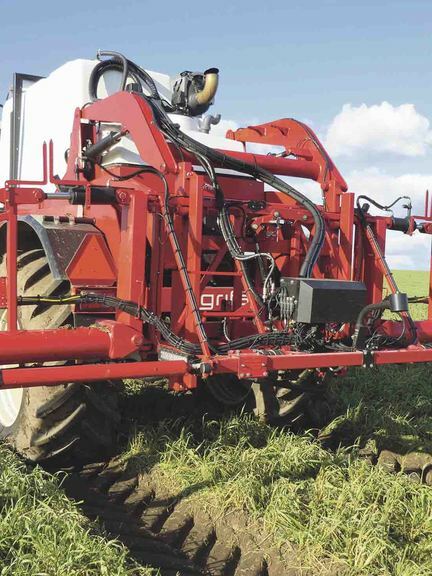 The Bargam Grimpeur 4000 has proved popular on a range of farms due to its mechanical drive and as it weighs less than 9,000kg unladen, even with large wheels fitted, suggested by the company as a good option for steeper and wetter land.